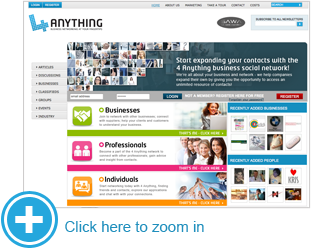 Welcome to the wonderful networking world of 4 Anything. We want to make sure you make the most of our resources, so if you're a new member, or if you just want to see what new and exciting on 4 Anything, scroll down to take a quick tour of what we have in store for you. 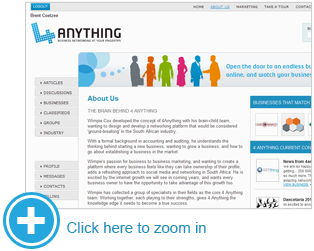 If you have any further questions or problems, please email us at info@4anything.co.za and we'll get in touch with you shortly. Navigate where you want to go from HOME. Start exploring and networking while having fun! Make sure you register or login to make full use of the 4 Anything website. 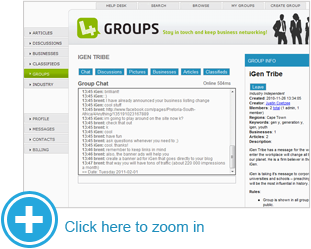 From articles, discussions, business listings, classified ads or get interactive in groups - we've got it all for you. Watch out for exciting 4 Anything news to give you updates on all our new developments. If you have a business listing and want to advertise with us, your advert could feature on the home page and increase your visibility on 4 Anything. Subscribe to our newsletters and make sure you are always in the loop. Keep up to date with the developments and messages from your account and inbox. Track your contacts as you are able to see their status updates in your PROFILE. Keep your finger on what is happening around you. Add photos/ pictures and publish them. Get to know your contacts, and keep track of who you connect with. Be able to track when a connection is made with a contact. 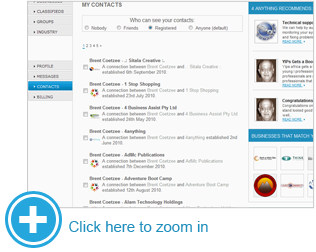 Find out all that you want to know about your contacts. Register a business and start networking and connecting with other businesses. Choose who can see your contacts, and have the power to be as private as you like. Message or delete contacts when you need to. Learn more about the general 4 Anything information. We want to inform you as much as possible. Find out more about how 4 Anything came about and our team. Also learn more about what 4 Anything can do for you in MARKETING. You can also find out further details about advertising with us here - buy your banner advertising space today! Start exploring ARTICLES buy looking through all the articles that have already been posted. Search and read articles that interest you. Make comments on articles when you have something to say. 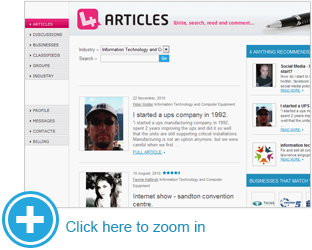 Write and publish your own articles to share with friends and colleagues. Make use of valuable recommendations from 4 Anything in your notice board. 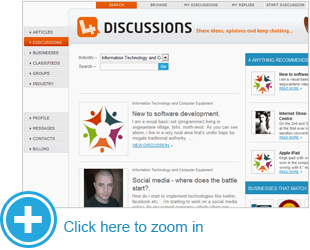 Interact with other 4 Anything members by starting or replying to DISCUSSIONS. Search for discussions that interest you. Reply to discussions at your own leisure. Make sure your opinions are heard. Become a member and register any business. Networking couldn't get easier than this! 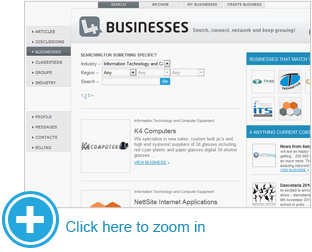 Search for a business by name, industry or region. 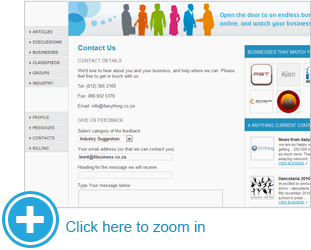 Find out more about your suppliers or clients. Interact with business owners and hold people accountable for their offered services. Set up your own business website presence in 5 minutes. Share up to date specials or promotions. Find more business, all at your fingertips. Watch recommendations and your 4 Anything feed for valuable updates and information..
"One man's trash is another man's treasure" - post your own adverts. Post an advert for items you are selling or searching for. 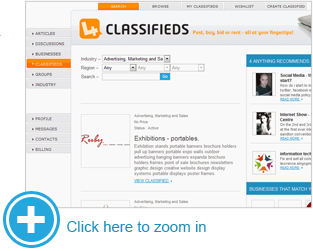 Search through all adverts by industry and region. Bid and buy on items that are posted in this section. You can even find items to rent. If we don't have it - ask other members and you may be surprised. 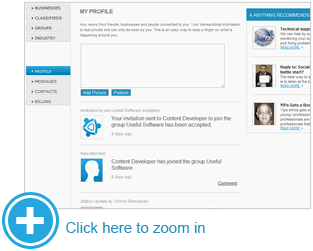 A new and exciting tool we have added onto the 4 Anything website is the 'Groups' application. This will be one of many ways of staying in touch and networking with clients and other businesses. Inter-communication between clients and business, business and supplier, and the individual. Businesses can target other businesses and have more control over who they interact with. Better response time to queries or issues. Deriving valuable feedback on your business, assisting you to improve in weak areas, and remain strong in areas where you are excelling. The groups are free to create and join! Watch recommendations and your 4 Anything feed for valuable updates and information. Define what you are looking for to make the most of 4 Anything. 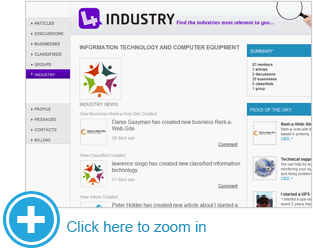 Search through all the industries currently on 4 Anything. If you are searching for a specific skill or business, this will help define your search. Connect with people or businesses in your industry. Find out more about the industry you work in, and stay ahead of the rest. We'd love to hear about you and your business, and help where we can. Please feel free to get in touch with us. Find out all the methods of contacting us. If you would like to give us feedback or have a particular question, fill in the contact form and we will be in touch with you shortly. 4Anything is a business network that helps companies expand their own; giving them the opportunity to do business while getting personal with their consumers. We are about your business, helping you reach success through networking. Register today to start your 4 Anything adventure - open the door to an endless business community online, and watch your business grow.